Community involvement helped bring Phase 1 of the project to a close in September 2017, and the support continues as the airport prepares to kick off Phase 2 construction later this year. “This community is unlike any other,” Gill states categorically. West Michigan has experienced tremendous growth over the years, and so has GRR. The Grand Rapids airport has logged record passenger numbers for five straight years. It finished 2017 with 2.81 million passengers, a 5.95% increase from 2016. And Gill says it is “definitely on pace for big numbers this year.” As of March 2018, year-to-date passenger traffic was up 15.3%. 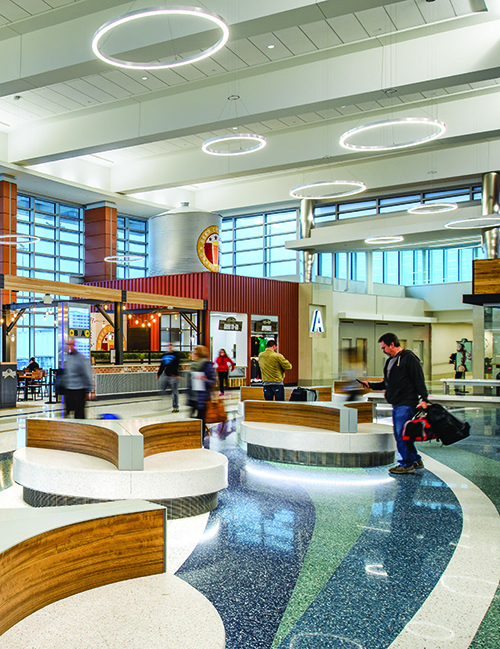 Concourse B General Contractor: The Christman Co.
To that end, the airport began construction of its Gateway Transformation Project Phase 1 in December 2015. Over a 21-month period, GRR added 59,000 square feet to the terminal to accommodate a new consolidated passenger screening checkpoint and improve the overall airport experience for travelers. Renovated restrooms, new concessions, four new business lounges, a post-checkpoint children’s playroom, mother’s nursing room and upgraded seating all combine to make the airport more comfortable for passengers. Prior to the renovation, GRR’s terminal was often described as institutional. “It could have been an airport or a hospital,” explains Tara Hernandez, GRR marketing and communications director. The redeveloped space, however, looks and feels much different. More natural light and an open design make the entire facility brighter and friendlier, she notes. The design and finish materials in the new space celebrate West Michigan with subtle visual references to water, wind and the coast—from the terrazzo flooring to murals of regional scenes on the walls. Materials were also selected to blend with existing facilities. “They wanted it to have character, be expressive of the region and be a state-of-the-art facility—something that matches the aspirations and sophistication of the community itself,” Peterson explains. “The idea was to represent the region the best way we can,” says Gill. Previously, separate checkpoints in concourses A and B each had two screening lanes, plus the option to open a pre-check lane as demand warranted. The new consolidated checkpoint includes six screening lanes, a dedicated pre-check lane and the ability to add a seventh lane, pending equipment and staff. The transition from two checkpoints to one was carefully coordinated to minimize disruption to passenger flow, says Brian Scherrer, project manager at Faith Group. While some of the TSA-provided equipment was installed before the move, the major shift was phased over the course of a weekend. “A lot of pre-planning in anticipation of the move helped it go very well,” reports Sal Mazzola, a senior security systems designer with the firm. A single, centralized screening checkpoint provides a more efficient security screening experience than the two separate checkpoints GRR previously had. It also allows passengers access to post-security amenities on both concourses. Previously, food and beverage locations were concentrated before the TSA checkpoints. The additional square footage added during Phase 1 allowed for more post-security options. 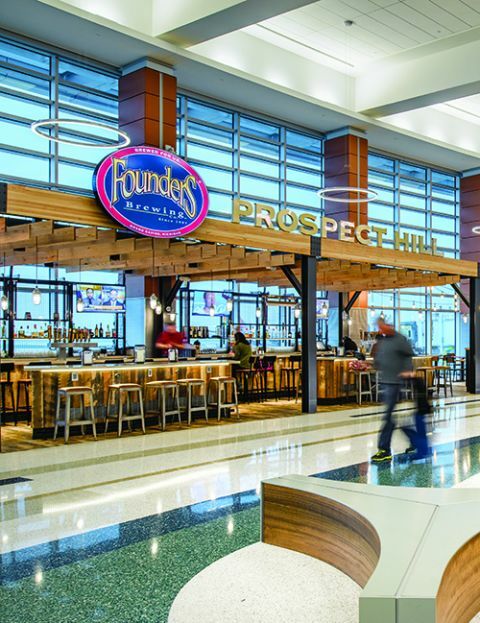 HMSHost focused on providing a blend of local and national offerings, just as travelers expect in today’s airports, says Bryan Loden, vice president of business development for the concessionaire. Prospect Hill Brewhouse, a new partnership with HMSHost, provides that local reflection. “They don’t want to look like ‘Any Airport, USA,” Loden explains. Experiencing a unique “hometown flavor” is something passengers appreciate at GRR, Gill adds. 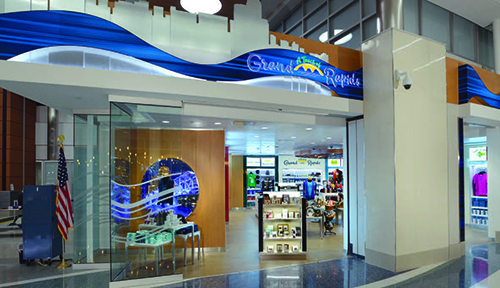 Hudson Group opened several Michigan-themed retail locations behind the security checkpoint, including a Touch of Grand Rapids, which features regional foods, gifts, souvenirs, apparel and fashion accessories. The airport retailer also operates two Grand Rapids Magazine Travel Stores and two Destination Michigan locations that feature travel essentials and convenience products. Gill notes that the new consolidated checkpoint makes it easier for travelers to spend their money. Rather than waiting in lengthy security lines, they are getting through in a more efficient manner with time to enjoy GRR’s concessions. Loden reports that HMSHost sales are up about 45% year-to-date. He attributes the growth to the airport’s increasing traffic numbers and the variety and quality of food and beverage options now available to travelers. 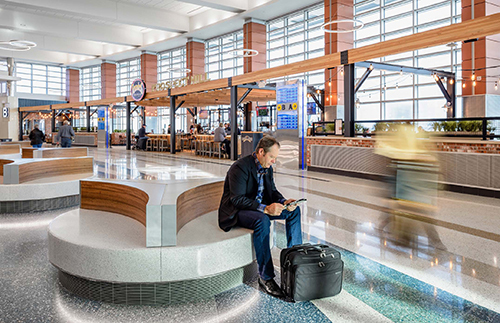 “We knew that the opportunity was there for an enhanced guest experience once the airport did this Transformation project; but we’re still very pleasantly surprised on how everything is going,” he says. As part of Phase 1, HMSHost gained nearly 4,000 square feet for its food and beverage program. GRR also took the opportunity to make technology improvements. Specific projects include an access control upgrade, new video surveillance system, updating the flight information display system, dynamic signage improvements, a new 22-by-8-foot video wall at the front of the security checkpoint, a new communications room and installation of a queue management system for the passenger screening checkpoint. The queue management system is a camera-based system that provides real-time analytics by measuring when passengers enter and exit the queue. The data it collects helps the airport and TSA managing staffing levels and informs travelers of the estimated processing times. “People can check that and plan ahead and have a more relaxed experience,” Scherrer notes. 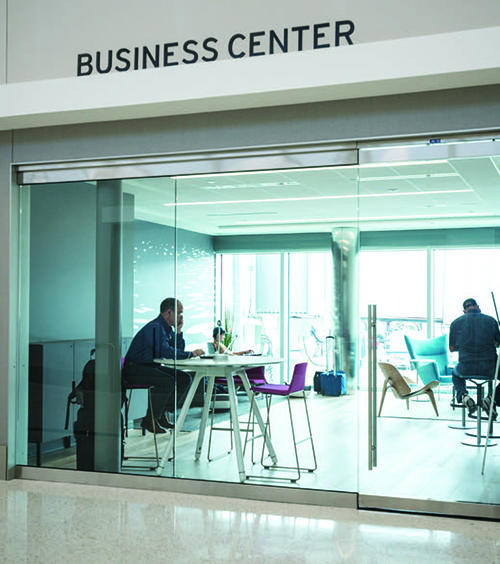 The new communications room provides a secure, centralized data center for the airport and its tenants, with ample space for future enhancements. “The communications room that we built was very forward-looking to provide connectivity and growth,” says Mazzola. Security cameras that can be adjusted remotely provide expanded and flexible surveillance coverage of the facility. Like any airport, GRR was faced with how to finance its capital improvements. 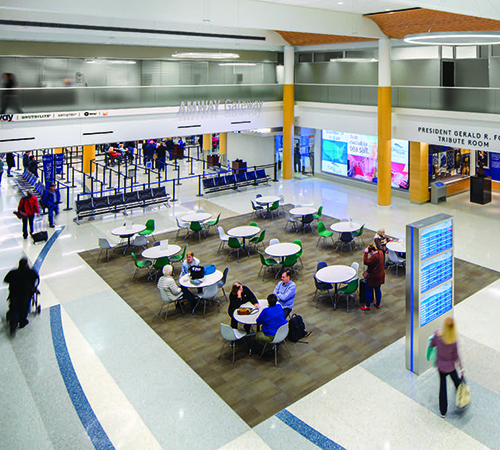 The West Michigan region has always been philosophically supportive of the airport, and that positive relationship helped spur the idea of soliciting local financial support for the renovation program, explains Gill. “We’re very fortunate that the community is so supportive of the airport,” he reflects. The airport developed an outreach campaign in partnership with the Regional Air Alliance, an economic development group of West Michigan business leaders that focuses on supporting the airport. The mission of the campaign was to make sure that other business leaders understood exactly what they were investing in at GRR. “By far, it was an overwhelming success,” Gill reports. In total, GRR received $17.1 million in private funds for the $45 million Gateway Transformation Project. Amway’s $8 million donation made it the title sponsor. Donations came in the form of cash, equipment and in-kind services. For instance, Steelcase donated money, furniture and helped build out the new business centers. “It’s a great way for them to show off their product,” Gill relates. SpartanNash, a grocery retailer and food distributor headquartered in West Michigan, sponsored the construction of the Military Welcome Center. Located pre-security, it provides refreshments, charging stations, flight information monitors and lounging space for active military members, veterans and their families. Spectrum Health Helen DeVos Children’s Hospital redesigned and added a new children’s play area, family restrooms and nursing rooms. In partnership with the Gerald R. Ford Presidential Foundation, the airport added an exhibit of photos, an aircraft carrier model and rotating pieces from the Gerald R. Ford Museum, dedicated to the airport’s namesake. Gill suspects that GRR’s transformation project would have moved forward without private contributions, but the burden of the associated debt service would have largely fallen on the backs of the airlines. “It wasn’t a matter of saying ‘forget about that consolidated checkpoint if you don’t come up with some money,’” he relates. Rather, it was an opportunity to engage the community and continue to make the airlines that serve the airport successful. Phase 2 of the Gateway Transformation is currently in the planning stages and will update “front-of-house” areas such as ticketing and baggage claim. GRR is one of the few U.S. airports with CTX baggage screening machines still in the lobby. “The first order of business is to get those machines behind the wall,” Gill says. As with Phase 1, Phase 2 will focus on modernizing aesthetics and improving passenger convenience, while ensuring flexibility for the future. “If we grow, we want to make sure that we have the technology and assets in place to be able to respond to that from a passenger processing or airline standpoint,” explains Gill. Improvements to airline ticketing, baggage screening and baggage claim, as well as additional restrooms and more pre-security concessions are in the works to help meet those goals. Construction is expected to begin later this year and be complete by the end of 2019. Additionally, officials are in the process of updating GRR’s master plan, which includes airside capacity enhancements to address growing traffic. “Our growth has been phenomenal, but we have to make sure that we’re always ready for that next level of growth,” Gill notes.